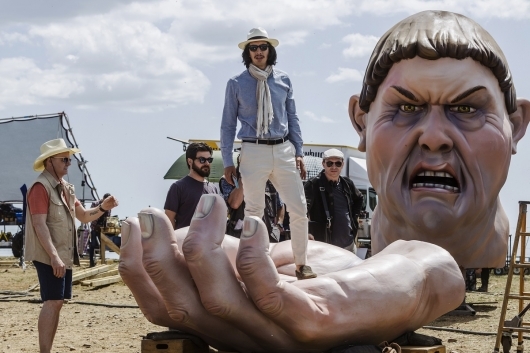 On April 10, 2019, North American audiences will get the first look at Terry Gilliam’s long-awaited film The Man Who Killed Don Quixote, co-starring Adam Driver and Jonathan Pryce. Over 25 years in the making, the film had its world premiere at the 2018 Cannes Film Festival. The film will play in over 700 U.S. cinemas and select Canadian locations for one night on Wednesday, April 10, 2019, with exclusive bonus features. Presented by Fathom Events and Screen Media Films, The Man Who Killed Don Quixote is the story of Toby (Driver), a cynical advertising director, who finds himself trapped in the outrageous delusions of an old Spanish shoe-maker (Pryce) who believes himself to be Don Quixote. In the course of their comic and increasingly surreal adventures, Toby is forced to confront the tragic repercussions of a film he made in his idealistic youth – a film that changed the hopes and dreams of a small Spanish village forever. Can Toby make amends and regain his humanity? Can Don Quixote survive his madness and imminent death? Or will love conquer all? Written and directed by Terry Gilliam (Monty Python, Brazil, Time Bandits), the film stars Adam Driver (BlacKkKlansman, Star Wars: The Force Awakens), Jonathan Pryce (Tomorrow Never Dies, Brazil, “Game of Thrones”), Stellan Skarsgard (Mamma Mia!, Good Will Hunting), Olga Kurylenko (Oblivion, Quantum of Solace), and Jordi Molla (Blow, Riddick). Tickets for U.S. screenings can be purchased online by visiting www.FathomEvents.com or at participating theater box offices. For a complete list of U.S. theater locations, visit the Fathom Events website (theaters and participants are subject to change). Fathom Events is partnering with Cineplex to distribute this event in Canada. For more information, including how to purchase tickets, visit www.Cineplex.com. Co-written by Tony Grisoni (Tideland, How I Live Now), The Man Who Killed Don Quixote was produced by Mariela Besuievsky (The Secret in Their Eyes, The Oxford Murders), Amy Gilliam (The Imaginarium Of Doctor Parnassus, Push), Gerardo Herrero (The Secret in Their Eyes) and Gregoire Melin (Planetarium), and executively produced by Alacran Pictures / Alessandra Lo Savio and Giorgia Lo Savio. It’s pretty surprising that the movie, after all this time, will only be in theaters for one single day. Perhaps it’s a test to see how it does, and if lots of folks turn out it will get some more time on the big screen. If you missed it, click right here for a previously released trailer.